The 1215 charter established the principle that the king is subject to the law. LONDON — An American tourist from Louisiana helped stop a hammer-wielding thief who tried to steal the Magna Carta at Salisbury Cathedral, working in tandem with a church employee to prevent the man from escaping. Matthew Delcambre, of New Iberia, Louisiana, said he and his wife, Alexis, were sightseeing in the southwestern English city when a man tried to shatter the glass encasing the precious manuscript in the church’s Chapter House. After Alexis raised the alarm to others, Delcambre and other bystanders banded together to hold the thief back behind the doors of the Chapter House. When the thief pushed past them, the 56-year-old IT expert gave chase into an outer courtyard. He grabbed the man’s arm near the courtyard gate and knocked away the hammer. A church employee tackled him and held him down. 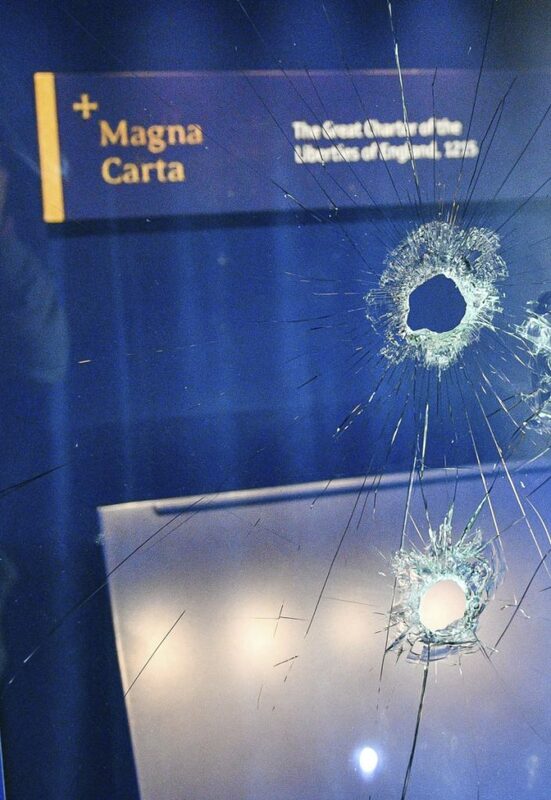 The Magna Carta, which was protected by two layers of thick glass, wasn’t damaged. Salisbury Cathedral’s Magna Carta is one of four existing specimens of the 1215 charter that established the principle that the king is subject to the law. It is considered the founding document of English law and civil liberties and influenced the creation of the U.S. Constitution. The document, Latin for “Great Charter,” was short-lived. Despotic King John, who met disgruntled barons and agreed to a list of basic rights, almost immediately went back on his word and asked the pope to annul it, plunging England into civil war. It was re-issued after the king’s death. Even so, its importance cannot be underestimated, as it has inspired everyone from Mahatma Gandhi to Nelson Mandela. Matthew Delcambre, director for the Center for Business & Information Technologies at the University of Louisiana at Lafayette, said he told his story so that his efforts would not be exaggerated at the expense of others. Islamic State gunmen kill 40 fighters backed by U.S.